In mammals, the bony pelvis has a gap in the middle, significantly larger in females than in males. Their young pass through this gap when they are born. The pelvic region of the trunk is the lower part of the trunk, between the abdomen and the thighs. It includes several structures: the bony pelvis, the pelvic cavity, the pelvic floor, and the perineum. The bony pelvis (pelvic skeleton) is the part of the skeleton embedded in the pelvic region of the trunk. It is subdivided into the pelvic girdle and the pelvic spine. The pelvic girdle is composed of the appendicular hip bones (ilium, ischium, and pubis) oriented in a ring, and connects the pelvic region of the spine to the lower limbs. The pelvic spine consists of the sacrum and coccyx. Alternatively, the pelvis is divided into three planes: the inlet, midplane, and outlet. Modern humans are to a large extent characterized by bipedal locomotion and large brains. Because the pelvis is vital to both locomotion and childbirth, natural selection has been confronted by two conflicting demands: a wide birth canal and locomotion efficiency, a conflict referred to as the "obstetrical dilemma". The female pelvis, or gynecoid pelvis, has evolved to its maximum width for childbirth—a wider pelvis would make women unable to walk. In contrast, human male pelvises are not constrained by the need to give birth and therefore are more optimized for bipedal locomotion. The angle between the inferior pubic rami is acute (70 degrees) in men, but obtuse (90–100 degrees) in women. Accordingly, the angle is called subpubic angle in men and pubic arch in women. Additionally, the bones forming the angle/arch are more concave in females but straight in males. The acetabula are wider apart in females than in males. In males, the acetabulum faces more laterally, while it faces more anteriorly in females. Consequently, when males walk the leg can move forwards and backwards in a single plane. In females, the leg must swing forward and inward, from where the pivoting head of the femur moves the leg back in another plane. This change in the angle of the femoral head gives the female gait its characteristic (i.e. swinging of hips). 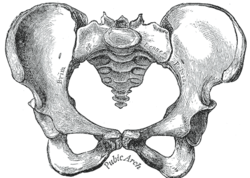 There is preliminary evidence that the pelvis continues to widen over the course of a lifetime. Its secondary functions are to contain and protect the pelvic and abdominopelvic viscera (inferior parts of the urinary tracts, internal reproductive organs), providing attachment for external reproductive organs and associated muscles and membranes. The three extracapsular ligaments of the hip joint—the iliofemoral, ischiofemoral, and pubofemoral ligaments—form a twisting mechanism encircling the neck of the femur. When sitting, with the hip joint flexed, these ligaments become lax permitting a high degree of mobility in the joint. When standing, with the hip joint extended, the ligaments get twisted around the femoral neck, pushing the head of the femur firmly into the Acetabulum, thus stabilizing the joint. The zona orbicularis assists in maintaining the contact in the joint by acting like a buttonhole on the femoral head. The intracapsular ligament, the ligamentum teres, transmits blood vessels that nourish the femoral head. Hip fractures often affect the elderly and occur more often in females, and this is frequently due to osteoporosis. There are also different types of pelvic fracture often resulting from traffic accidents. Pelvic pain generally, can affect anybody and has a variety of causes; endometriosis in women, bowel adhesions, irritable bowel syndrome, and interstitial cystitis. 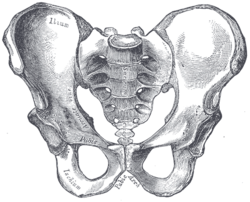 There are many anatomical variations of the pelvis. In the female the pelvis can be of a much larger size than normal, known as a giant pelvis or pelvis justo major, or it can be much smaller, known as a reduced pelvis or pelvis justo minor. Other variations include an android pelvis the normal shape of the male pelvis, in women this shape can prove problematic in childbirth. The classification of Caldwell and Moloy was influenced by earlier classifications attempting to define the ideal female pelvis, treating any deviations from this ideal as dysfunctions and the cause of obstructed labour. 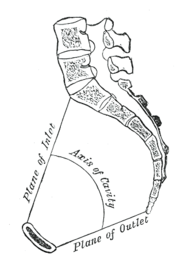 In the 19th century anthropologists and others saw an evolutionary scheme in these pelvic typologies, a scheme since then refuted by archaeology. Since the 1950s malnutrition is thought to be one of the chief factors affecting pelvic shape in the Third World even though there are at least some genetic component to variation in pelvic morphology. The pelvic girdle was present in early vertebrates, and can be tracked back to the paired fins of fish that were some of the earliest chordates. The shape of the pelvis, most notably the orientation of the iliac crests and shape and depth of the acetabula, reflects the style of locomotion and body mass of an animal. In bipedal mammals, the iliac crests are parallel to the vertically oriented sacroiliac joints, where in quadrupedal mammals they are parallel to the horizontally oriented sacroiliac joints. In heavy mammals, especially in quadrupeds, the pelvis tend to be more vertically oriented because this allows the pelvis to support greater weight without dislocating the sacroiliac joints or adding torsion to the vertebral column. In ambulatory mammals the acetabula are shallow and open to allow a wider range of hip movements, including significant abduction, than in cursorial mammals. The lengths of the ilium and ischium and their angles relative to the acetabulum are functionally important as they determine the moment arms for the hip extensor muscles that provide momentum during locomotion. In addition to this, the relatively wide shape (front to back) of the pelvis provides greater leverage for the gluteus medius and minimus. These muscles are responsible for hip abduction which plays an integral role in upright balance. Larger apes, such as Pongo (orangutans), Gorillas (gorillas), Australopithecus afarensis (Lucy), and Pan troglodytes (chimpanzees), have longer three-pelvic planes with a maximum diameter in the sagittal plane. The present-day morphology of the pelvis is inherited from the pelvis of our quadrupedal ancestors. The most striking feature of evolution of the pelvis in primates is the widening and the shortening of the blade called the ilium. Because of the stresses involved in bipedal locomotion, the muscles of the thigh move the thigh forward and backward, providing the power for bi-pedal and quadrupedal locomotion. The drying of the environment of East Africa in the period since the creation of the Red Sea and the African Rift Valley saw open woodlands replace the previous closed canopy forest. The apes in this environment were compelled to travel from one clump of trees to another across open country. This led to a number of complementary changes to the human pelvis. It is suggested that bipedalism was the result. ^ a b c d e f Moore 2014, pp. 357–8. ^ Betti, Lia (March 17, 2017). "Human variation in pelvic shape and the effects of climate and past population history". The Anatomical Record. 300 (4): 687–697. doi:10.1002/ar.23542. PMID 28297180. ^ "Gynecoid pelvis". MedicineNet. Retrieved 2016-03-22. ^ Merry 2005, p. 48. ^ Merry 2005, pp. 50–1. ^ a b c d e Merry 2005, p. 50. ^ Merry 2005, p. 72. ^ Vleeming A, Schuenke MD, Masi AT, Carreiro JE, Danneels L, Willard FH (December 2012). "The sacroiliac joint: an overview of its anatomy, function and potential clinical implications". Journal of Anatomy (Review). 221 (6): 537–67. doi:10.1111/j.1469-7580.2012.01564.x. PMC 3512279. PMID 22994881. ^ Berger AA, May R, Renner JB, Viradia N, Dahners LE (November 2011). "Surprising evidence of pelvic growth (widening) after skeletal maturity". Journal of Orthopaedic Research : Official Publication of the Orthopaedic Research Society. 29 (11): 1719–23. doi:10.1002/jor.21469. PMID 21608025. ^ "When should my baby's head engage? If it engages early does that mean I am going to give birth early?". BabyCentre. Retrieved 1 June 2009. ^ "Pelvic Pain during Pregnancy". Baby Care Guide. Archived from the original on 2009-03-21. Retrieved 1 June 2009. ^ "Female Pelvic Pain". Pain relief medication. Retrieved 1 June 2009. ^ "Pelvic Pain (Symphysis Pubis Dysfunction)". Plus-Size Pregnancy Website. April 2003. Retrieved 1 June 2009. ^ "Part 2 - Labor and Delivery". Ask Dr Amy. Retrieved 1 June 2009. ^ Merry 2005, pp. 52–4. ^ Caldwell, W. E.; Moloy, H. C. (1938). "Anatomical Variations in the Female Pelvis: Their Classification and Obstetrical Significance: (Section of Obstetrics and Gynaecology)". Proceedings of the Royal Society of Medicine. 32 (1): 1–30. PMC 1997320. PMID 19991699. ^ Merry 2005, pp. 55–6. ^ Merry 2005, p. 52. ^ Merry 2005, p. 56. ^ Merry 2005, p. 57. ^ Merry 2005, pp. 58–9. ^ Gregory, William K. (1935). "The pelvis from fish to man: a study in paleomorphology". The American Naturalist. 69 (722): 193–210. doi:10.1086/280593. JSTOR 2456838. ^ Sreekanth, R (September 2015). "Human evolution: the real cause for birth palsy". West Indian Medical Journal. 64 (4): 424–428. doi:10.7727/wimj.2014.083. PMC 4909080. PMID 26624599. Hall, Brian Keith (2007). Fins into limbs: evolution, development, and transformation. University of Chicago Press. ISBN 978-0-226-31337-5. Retrieved 2010-08-14. Holm, Niels J. (1980). "The Internal Stress Pattern of the os Coxae". Acta Orthopaedica. 51 (51:1): 421–428. doi:10.3109/17453678008990818. Merry, Clare V. (2005). "Pelvic Shape". Mind – Primary Cause of Human Evolution. Trafford Publishing. ISBN 1-4120-5457-5. Retrieved 2010-08-14. Moore, Keith L. (2014). Clinically oriented anatomy. Williams & Wilkins. ISBN 978-1-4511-1945-9. Morris, Craig E. (2005). Low Back Syndromes: Integrated Clinical Management. McGraw-Hill. ISBN 978-0-07-137472-9. Palastanga, Nigel; Field, Derek; Soames, Roger (2006). Anatomy and Human Movement: Structure and Function. Elsevier Health Sciences. ISBN 978-0-7506-8814-7. Thieme Atlas of Anatomy: General Anatomy and Musculoskeletal System. Thieme. 2006. ISBN 978-1-58890-419-5.